The concentration of wealth today in such a small number of hands inevitably created a dynamic that led to freewheeling financial speculation a dynamic that produced similarly disastrous results in the last great age of inequality, in the 1920s. Such concentrated economic power reverberates throughout society, threatening the quality of life and the very functioning of democracy. As McQuaig and Brooks illustrate, it’s no accident that the United States claims the most billionaires but suffers from among the highest rates of infant mortality and crime, the shortest life expectancy, and the lowest rates of social mobility and electoral political participation in the developed world. 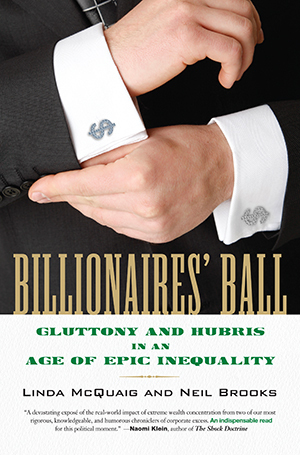 In Billionaires’ Ball, McQuaig and Brooks take us back in history to the political decisions that helped birth our billionaires, then move us forward to the cutting-edge research into the dangers that concentrated wealth poses. Via vivid profiles of billionaires ranging from philanthropic capitalists such as Bill Gates to hedge fund king John Paulson and the infamous band of Koch brothers Billionaires’ Ball illustrates why we hold dearly to the belief that they “earned” and “deserve” their grand fortunes, when such wealth is really a by-product of a legal and economic infrastructure that’s become deeply flawed. Imagine this: you are given one dollar every second. At that rate, after one minute, you would have sixty dollars. And after twelve days, you would be a millionaire--something beyond most people’s wildest dreams. But how long would it take to become a billionaire? Well, at that rate, it would take almost thirty-two years. Being a billionaire isn’t just beyond most people’s wildest dreams; it’s likely beyond their comprehension. Another way to grasp the sheer size of billionaires’ fortunes is to imagine how long it would take Bill Gates, generally considered the world’s richest man, to count his $53 billion. If he counted it at the same rate--one dollar every second--and he counted nonstop day and night, he’d have it all tallied up in 1,680 years. Still another way to look at it is this: if Bill Gates had started counting his fortune at that rate back in 330 ad--the year that the Roman emperor Constantine had his wife boiled alive and chose Byzantium as the empire’s new capital--he’d just be finishing up now. As a result of the dramatic increase in the concentration of income and wealth at the top during the last few decades, the United States has become an extremely unequal society. Before going any farther, we should point out that we are not against all inequality. On the contrary, some reasonable degree of inequality is not only acceptable and inevitable but even desirable because it allows for different rewards for different levels of individual effort and contribution. But what exists today in the United States--and to a lesser extent in Britain and Canada--is a level of inequality that is extreme compared to the rest of the advanced, industrialized world. Indeed, the level of inequality in the United States today is actually more considerably extreme than what exists in many developing countries, including India, Cambodia, and Nigeria, and even in many Middle Eastern countries, such as Egypt and Tunisia, where excessive inequality is widely believed to have played a role in sparking the Arab spring uprisings of 2009-2010. Over the past three decades, virtually all the growth in American incomes has gone to the top 10 percent, with particularly large gains going to the top 1 percent and spectacularly large gains going to the top .01 percent. Between 1980 and 2008, the incomes of the bottom 90 percent of the population grew by a meager 1 percent, or an average of just $303. Meanwhile, over those same years, the incomes of the top .01 percent of Americans grew by 403 percent, or an average of a massive $21.9 million. The richest 300,000 Americans now enjoy almost as much income as the bottom 150 million. These high rollers make up an enormously rich and powerful class that can best be described as a plutocracy--not unlike the plutocracy of financial interests that dominated America back in the 1920s, when the opulence of the wealthy and their disproportionate influence over the political process was particularly blatant.